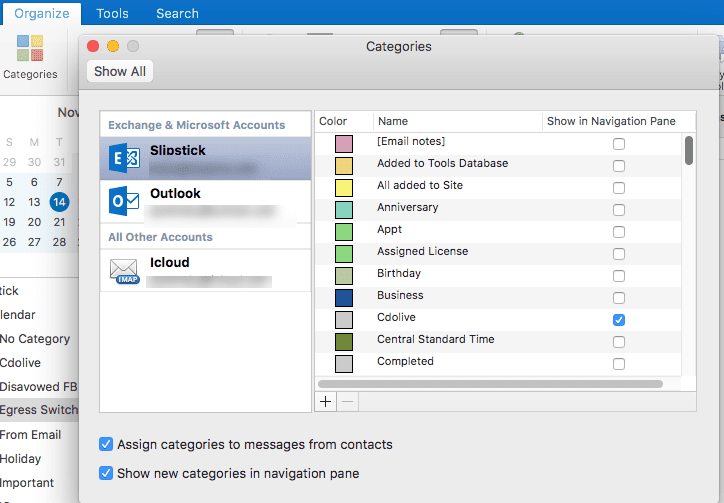 Categories and flags are not available in all of my folders in Microsoft Outlook. I can use categories and flags on mail in my POP3 account but categories are not available in my IMAP account and flags are limited to one flag, no reminder. Why? The IMAP protocol doesn't support the Category and Flag properties on messages and assigned categories and flags are not synced back to the IMAP server. If you need to use categories, you need to use a POP3 account instead or move the messages to a local pst file. In place of flags (and their reminders), drag the message to Tasks (or Calendar) and set the reminder. 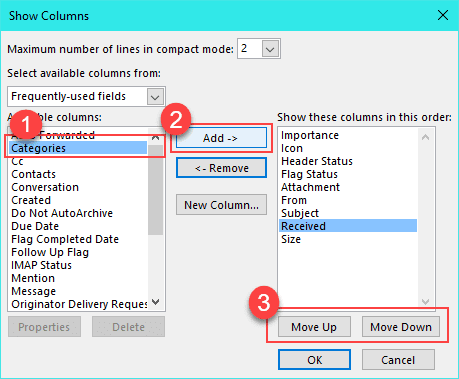 If using IMAP is a requirement, you can either move the mail to separate folders to separate it or use Automatic Formatting (Conditional formatting in Outlook 2010) to highlight messages meeting specific conditions. If you need reminders, drag the message to the Tasks folder and create a task with a reminder. If having special "this computer only" folders with reduced capabilities in Outlook's IMAP accounts isn't bad enough, I'm left scratching my head when I look at the half-removed Flag and Category features users have come to expect in Outlook. There is no reason why full flags and categories shouldn't work in an ost file, but users are stuck with the IMAP implementation, where flags are limited to on or off and the Categories button is non-existent. Whether you can add a category an appointment or contact, or add a category or reminder to a task depends on what view you are using and whether you know all the right tricks. The category picker is missing from appointments. But you can add categories if you assign keyboard shortcuts to at least one category and apply it. Once you add a category to an appointment, you can open the category MRU by right clicking on the category bar in the open appointment. In Contacts, all of the flag options are available. The keyboard shortcuts work for categories and as with the other Outlook items, once a category is applied, you can right click on it and make changes. You can even add categories from the options dialog (File, Properties). Yes, in the wacky world of Outlook 2013 IMAP accounts, the category picker on the Options dialog is disabled on mail, appointments, and tasks but it works on Contacts. A user discovered the trick to creating full reminders and color categories on tasks: select more than one. When you right click on one task, you'll get the short IMAP version of the context menu, with options to Flag, Mark Complete, or Delete. The only option for Categories is Clear All Categories (when you click on the Category column). Select 2 or more tasks and viola! The full flag and category menus appears on the context menu. In an open Task, the Categorize button has one option: clear all but keyboard shortcuts will add categories… and yes, the full category menu is available on the right-click context menu. The user went on to add "My solution right now is to just have a "dummy" task that I can select with the other tasks I want to change, but it's a pain to work around a bug like this, especially since Microsoft is expecting me to pay monthly for the software." When an IMAP account is configured in Outlook, there is just one option for flags: either flagged or not flagged. You may occasionally receive an error message when flagging items in IMAP accounts. This error is because Outlook is syncing with the server. Select a different message then switch back to the original message and you should be able to flag messages without error. If you need to set a reminder, drag the message to the Task folder to create a task. These instructions are for Outlook 2010 and below or Outlook 2013 and newer when you have a separate pst file for calendar and contacts, in addition to the IMAP data file. Use the instructions in the next section when you use only the IMAP account and use the 'this computer only' folder for Calendar and Contacts. While you can't change how flags work (except by moving the mail to a local pst), it is possible to trick Outlook into letting you add categories to IMAP messages. While a viewing a folder in a data file that supports categories, expand the Categories button and choose All Categories to open the Color Category manager. Add keyboard shortcuts to your categories. Since you are limited to 10, start with the most frequently used categories. Select (or open) the message and press the shortcut. Yes, the shortcuts work on IMAP messages. If you need to assign a category that does not have a keyboard shortcut assigned, add a category using a shortcut then open the message and right-click (or double-click) in the category area above the subject field. Choose the category from the list before removing existing categories from the message. In most cases, the category name will "stick" and sync to other computers running Outlook. However, colors are per message store so each computer will have it's own list of colors. How to Upgrade to Color Categories has instructions on how to quickly add categories to your master category list. The default IMAP view removed the Categories column from the message list view but you should see the category in the Reading pane or in opened messages. To see the category colors in the message list, you will need to customize the view. Move Categories up or down to place it just after Subject. Open a Contact (new or existing) and click it's File, Properties button. Click on Categories at the bottom then All Categories. Set up some categories and assign keyboard shortcuts. Use the shortcuts to assign categories to email, appointments, and contacts. After you add a category to an item, you can click on the Category InfoBar (see screenshot in previous section above) and select other categories. You can customize the Message list view and add the Category field to the view. However, this only allows you to use the quick click category. You can open the message and right click on the category bar to select more categories. Paste this into the VB Editor and add it to the toolbar or ribbon. Click the toolbar button to open the Category dialog. Add it to the QAT, ribbon, or toolbar. This works with messages selected in the message list or open message. This simple code can be added to the QAT, toolbar, or ribbon of a message form. Add the following code to the VB Editor and then add a button to the QAT, Ribbon, or Toolbar of a message form. Click the button to open the Category dialog. This code does not work with messages in the message list. To check your macro security in Outlook 2010 or newer, go to File, Options, Trust Center and open Trust Center Settings, and change the Macro Settings. In Outlook 2007 and older, it’s at Tools, Macro Security. Same question--I will wait patiently for the next update! Your insights, advice, and tutorials are without a peer! The shortcuts should be fixed at the end of Feb. I am currently using Office Home & Business 2016 with an IMAP account. I recently used your “Outlook 2013 and newer with only the IMAP data file” workaround to gain access to the category feature and it worked perfectly! Except after about a month of the category feature working just fine, now when I try using my shortcuts to categorize an email it does nothing. Seems like over night it stopped working...Could you please help me with this? Thank you! It was overnight. :) The last office update broke shortcuts, the next one should bring them back. Diane, any idea when this will be fixed?? I have the same problem... 365, IMAP, this computer only.... and suddenly I can no longer assign color categories to contacts and appointments using CTRL+F# shortcut. All of my previously-assigned categories are there but I can't assign new ones! Desperately need this to manage my work. Please tell me MS is going to fix this SOON. The broken shortcuts should be fixed at the end of the month. I believe its set to be released on the 26th of Feb. It's the same in 2016, 2019, and 365. Thank you for these instructions. I have a new client who wanted to use the color flags or categories on an IMAP email, I am I have worked for several hours with instructions that just say it should work. Thank you for both explaining that it doesn't work with the IMAP in Office 2013, and for the workaround. This likely save the new client for me. You also work with another client of mine- and have always provided great service. In Outlook for Mac (Version 15.37), how can other users on their Mac see the category colours i have assigned to emails?? It should be like it is on the windows version - they can see the category name (in open message), but the color will be white. They need to have the category in their category list to see colors, and will see the colors they set, not yours. They would need to be owners to see the colors. I'm very disappointed about the loss of Categories and Flags in 2016 as they are absolutely key to my "Time Management" advice to learners at the Community College where I teach. I've successfully created the Categories QAT button (although explaining it away is going to be a challenge) - is there an equivalent for Flags? Are you using an IMAP account? 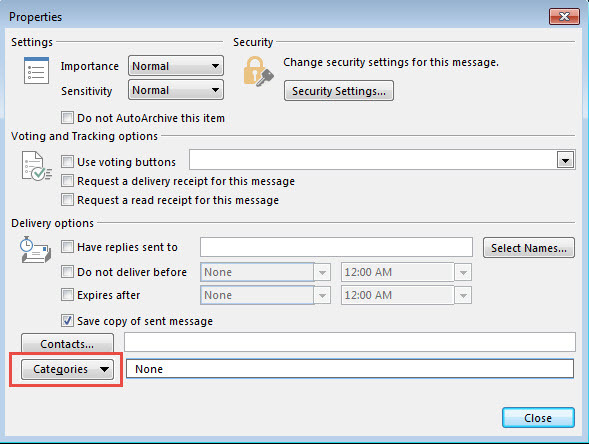 Categories and Flags should work "correctly" in pop3/pst and Exchange accounts (Outlook.com can be added as exchange in outlook 2010 and up), with the categories available on the Home ribbon or on a right click of a message. Flags shouldn't have any change - but in imap, they are flag on, flag off only. pop3/pst and exchange offer the full range of flags. Diane thank you for your amazingly fast response (and with the time difference too!!). I can only assume it is an IMAP account as the "symptoms" are as described in this article. It came as a rude shock to find the Categories "missing" and a good 45+ mins of my lesson plan (designed at home with a POP3 account) completely thrown. The problem is I haven't got much say over the policies/setup of the system which is shared by a variety of learners/communities), however I will enquire whether POP3 is feasible. Can you offer a solution to why in Outlook 2016 for Mac, not all my categories show up in the side bar? I have many contacts under several categories for whom the categories show up when you open the contact but not on the side bar. So the result is that I cannot show a group of contacts in any of the categories that don't show up on the side bar.